*Our pair of Alpinists came with the long demo heel track (30 mm of adjustment vs 15 mm for the standard), which likely weighs a few grams more than the standard heel track. The Alpinist 12 is Marker’s first foray into minimal touring bindings, and it’s also the first binding we are taking a look at in our Lightweight Touring Binding Shootout. We strongly encourage you to read the intro to our Shootout, since it spells out how exactly we chose, tested, and compared the bindings in the review. But here’s the CliffsNotes version: we mounted four pairs of 300-400 gram touring bindings on the exact same ski to test them all head-to-head. The bindings we’re including are the Alpinist 12, the Dynafit TLT Speed, The Hagan Core / ATK Raider 12 2.0, and the Atomic Backland Tour / Salomon MTN. The Alpinist 12 is one of the most fully featured bindings in the test, yet it still comes in at a very similar weight to the other options. So how does it actually perform in the mountains? Blister reviewer Luke Koppa and I have both been using the Alpinist 12, so we’ll both be weighing in here. Sam Shaheen: The Alpinist 12 doesn’t feature any really radical design departures from other tech bindings, but what makes the Alpinist unique is how it combines all of those features while coming in at a weight that’s closer to more minimal options. Sam: The toe piece on the Alpinist is pretty standard. It has a very similar design to the Marker Kingpin toe, but with only two springs (instead of the six on the Kingpin) and a slightly different geometry. The Alpinist’s toe seems to work quite well. It feels solid and the retention has been quite good during our testing. This could potentially be due to the Alpinist toe’s higher pivot point, which is roughly 3 mm higher than that on the toe pieces of the Dynafit TLT Speed and Rotation 10. The G3 Ion’s toe piece also has a higher pivot point, and we’ve found that binding to offer very good toe retention, too. 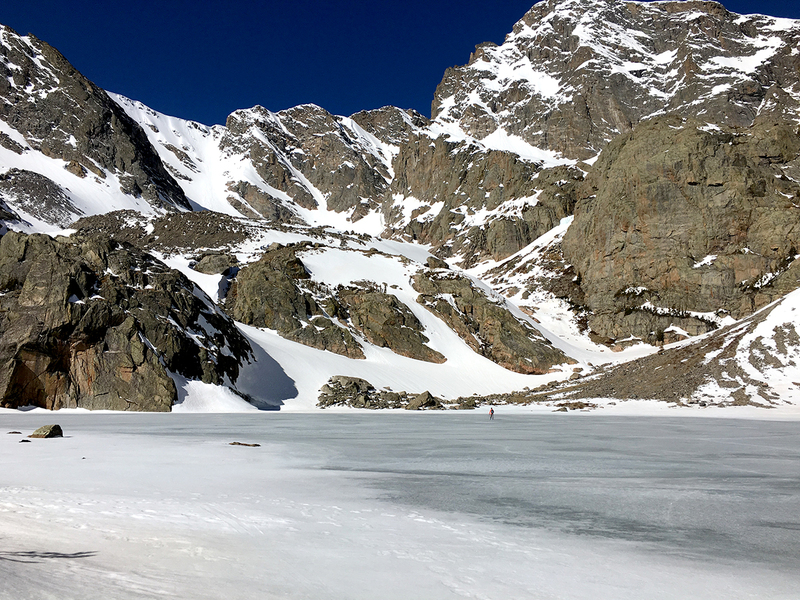 I’ve skied some pretty firm, rough, steep snow on the Alpinist and haven’t yet experienced any pre-releases, or felt the need to lock out the toe (even in situations where I would have locked out the toes on a binding like the Dynafit TLT Speed). The Alpinist toe also feels more solid when stepping in compared to the Kingpin’s toe (however counter-intuitive that may be). The only downside of the Alpinist toe is that it is fairly difficult to step into compared to the other bindings in our test. There are two pieces of white silicone rubber on the Alpinist toe that create a pseudo toe-stop to help with stepping in, but in practice, they are little more than visual aids. In most tech bindings, I can step in on my first try about 90% of the time, but with the Alpinist, that number is probably closer to 60%. Luke Koppa: I agree. I found the Alpinist to be one of the most difficult bindings in this test when it came to stepping in (the Atomic Backland Tour was similarly difficult). I did start to get the hang of stepping into the Alpinist after a few days, but even then, I still found that it often took me a couple tries to successfully step into the Alpinist. Sam: The heel of the Alpinist is where this binding really stands out. Like most tech bindings, the Alpinist’s heel tower rotates for lateral release and to transition between ski mode and walk mode. The Alpinist heel has adjustable release values for lateral release, with the Alpinist 12 having lateral release values from 6-12, and the Alpinist 9 being adjustable from 4-9. Vertical release on the Alpinist is controlled by its U-spring. Marker will sell three different U-spring options of varying levels of strength to adjust this (they call them “soft,” “medium,” and “hard”). The Alpinist 12 comes standard with the strongest “hard” spring, and the Alpinist 9 comes with the “medium” spring. The most intriguing feature on the Alpinist is the active length compensation in the heel. Just like some of the best performing pin bindings on the market (e.g., Fritschi Vipec EVO and G3 ION), the Alpinist heel is designed to be mounted flush with the heel of the boot. As the ski flexes, the Alpinist heel piece moves on a track to compensate for the change in length due to ski flex. 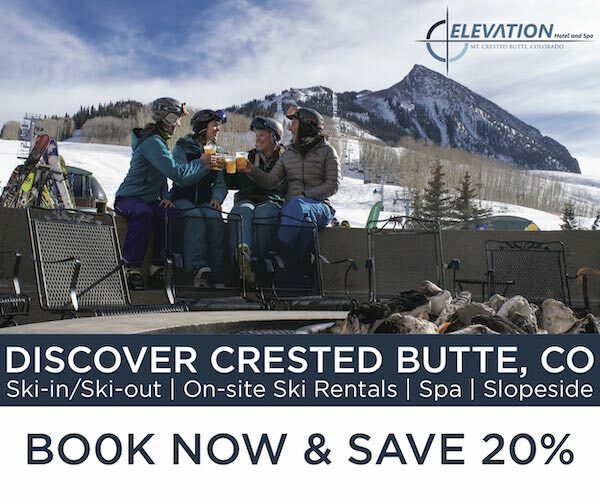 This feature is meant to increase the consistency of release and it also creates a better connection between the boot and ski. We’ll get more into the downhill feel of the binding further down, but the spoiler is: the Alpinist feels very smooth for how light it is. There is one curious and disconcerting behavior we’ve noticed with the Alpinist heel tower. When stepping into the binding in ski mode, the whole heel tower tilts forward as you weight the pins. There is probably 1-2 mm of movement at the top of the tower when fully weighted. This is certainly a point of concern with the Alpinist, but to the binding’s credit, we haven’t been able to feel this play on the downhill, and haven’t yet had any durability issues. We’ll obviously keep this review up to date if that changes. Sam: The Alpinist also comes with the option of leashes or brakes (our pair came mounted with brakes). Unlike some tech bindings, the Alpinist brake cannot be added or removed without taking the binding off the ski, since the brake fits in a slot underneath the heel tower. The brake is one of the weakest design points on the Alpinist. First, the brake arms hardly extend beyond the bottom of the ski. This isn’t an issue when putting the skis on a flat surface, but because of how small they are and how little they extend below the ski, the brakes offer very little stopping power, and we doubt they would do much (if anything) in the case of a runaway ski on a steep slope. 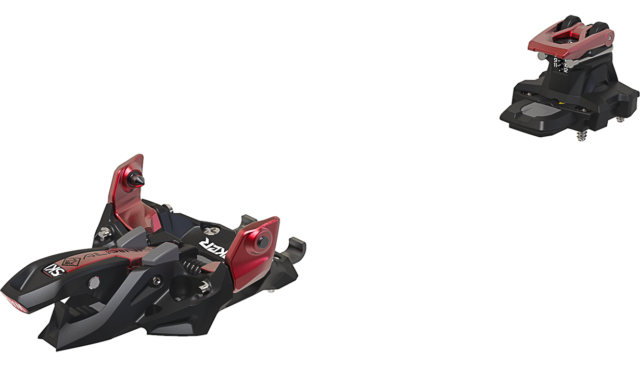 With that said, the Alpinist’s brakes are probably pretty similar to those on the Hagan Core, as neither of these brakes offer as much stopping power as the brakes on heavier tech bindings. The Alpinist’s brake lock mechanism is also a bit finicky. The brake lock is controlled by a small wire bail on the back of the heel track. Pushing the bail towards the tip of the ski allows the brake to lock, and pulling the bail towards the tail unlocks the brake. The issue here is that while skiing (when the brake needs to be unlocked to stop the ski in the event of a release), it is relatively easy to accidentally knock the brake lock mechanism into the “locked” position with your other ski, negating the usefulness of the brake in downhill mode. So it’s important to keep an eye on the brake lock to make sure it’s in the “unlocked” position. Sam: Uphill performance consists of far more than just weight (though a low weight certainly helps). The Alpinist uses tried and true design elements to create a simple, functional binding on the up, though not every one of its features feels totally refined / dialed in. The Alpinist’s heel piece rotates to switch to uphill mode. It is possible to rotate the heel with a pole tip like on other bindings, but on the Alpinist, this is quite a chore. On other bindings with rotating heels (e.g., the Dynafit Radical 2.0 or Speed Rotation), the heel piece rotates about 90-120° before reaching a point of no return and snapping into place (in either walk mode or ski mode). On the Alpinist, this snapping action only takes care of the last few degrees of rotation. As a result, I have to rotate the heel piece almost the full 180° with my pole tip, which has led to some very odd trailside acrobatics. Of course, you can also just kneel down and rotate the heel by hand, but it would nice to be able to more easily transition using a pole. Once in uphill mode, the Alpinist walks very well. It feels light on the feet (as it should, given its weight) and the toe lock-out feels solid and confidence-inspiring. Sam Shaheen on the Marker Alpinist 12, Rocky Mountain National Park, CO. The Alpinist’s heel risers seem to be built well, but they are some of the most difficult to use in our test. The Alpinist has three climbing levels: flat (heel rotated back, riser back); medium (heel rotated forward, riser forward); and high (heel rotated back, riser forward). To access the medium climbing position, you have to rotate the heel piece (which, as just discussed, isn’t the easiest thing to do). In practice, this isn’t that big of a deal, since the heel risers are so short overall. I find myself just switching between the “flat” and “high” modes so I don’t have to deal with rotating the heel. At 40 mm above the “flat” touring position, the highest riser on the Alpinist is about the same height as the medium risers on the Salomon MTN / Atomic Backland and ATK Raider 12 2.0 / Hagan Core 12. I’ve definitely been left wishing for a higher riser position for some skin tracks. If you tend to find yourself on steep skin tracks (I’m looking at you, Lake Tahoe), then the heel risers on the Alpinist might be a deal breaker. But if you like to set (or, let’s be honest — follow) more mellow skin tracks and don’t rely as much on your binding’s high risers, this will be less of an issue. Another slight annoyance with the Alpinist is the balance point. This isn’t unique to the Alpinist in our test, but rather, the lighter that any binding’s heel piece is, the farther forward the balance point ends up being. This means that on kick turns, the tip of the ski has a tendency to dip rather than pop up (like it does on most skis with heavier heel pieces). With lighter bindings like the Alpinist, a bit more “kick” in your kick turns tends to help keep the tip up. This is a small price to pay for the huge decrease in weight, just something to keep in mind. Sam: We’ve been A/B/C/D-ing all of the bindings in this test against each other for several weeks now, and there are a few important overall takeaways from our testing. First, the downhill performance of each binding is surprisingly similar. If we weren’t skiing them directly back-to-back, I doubt we would be able to discern many performance differences. Second (and perhaps even more surprising) is how hard we were able to ski on these bindings without pre-releasing or breaking anything — including ourselves. Much of our downhill-performance testing was done inbounds on firm or soft, chopped-up snow and at very high speeds. All of the bindings in the test performed surprisingly well (though the real standout in our Shootout was easily the ski — the Salomon MTN Explore 95 that we had all the bindings mounted on is just soooo good. Though all the bindings performed pretty similarly in terms of downhill performance, the Alpinist did have the most distinct performance characteristics out of the group, in that it felt smoother than all the other bindings we tested. There is less feedback transferred to the boot in rough, icy snow. The Alpinist also provides a smoother feel when blasting through large piles of softer, chopped-up snow. This smoothness is subtle, but noticeable. 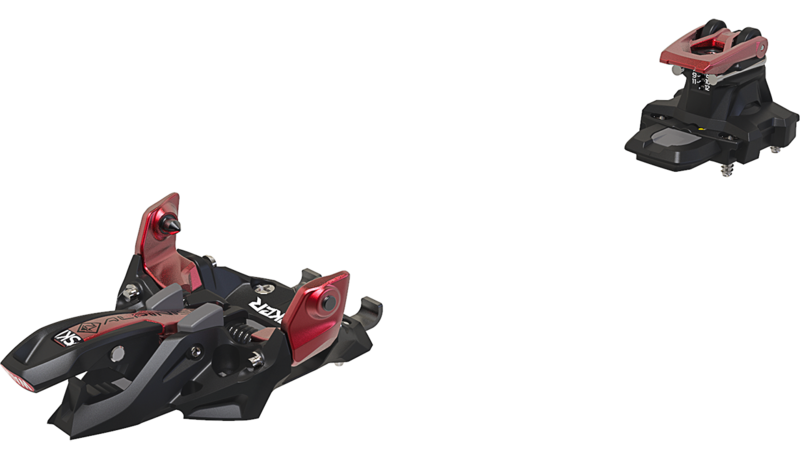 The Alpinist also edges out the ATK Raider 2.0 / Hagan Core in terms of power transfer, putting the Alpinist at the top of the group. This is again, pretty subtle, but noticeable when skiing the skis back-to-back. 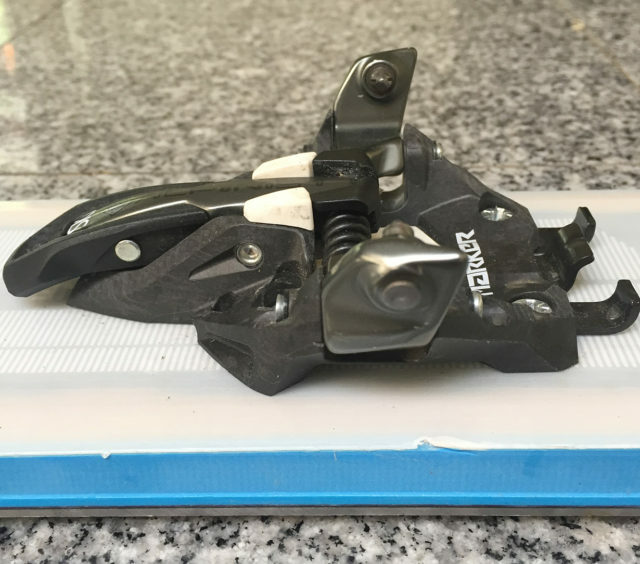 It is worth noting though that we do not have the Freeride Spacer on our ATK Raider 2.0 / Hagan Core 12 binding, and we suspect it would improve that binding’s power transfer (though at a slight weight penalty). Luke Koppa on the Marker Alpinist 12, Arapahoe Basin, CO.
One of the performance characteristics that I didn’t expect to notice between the bindings was how much they’d affect the amount of rebound and energy transmitted from the ski. I think the smooth feeling of the Alpinist that helps to dampen out some vibrations also takes a bit of the energy out of the ski when transitioning turns. Both the Raider 2.0 / Core and MTN / Backland felt like they transferred more energy and pop from the MTN Explore 95 compared to the Alpinist. Luke: When it came to skiing hard and fast, the Alpinist was definitely my favorite binding in our test. I was very surprised by how smooth it felt, especially given its very low weight. 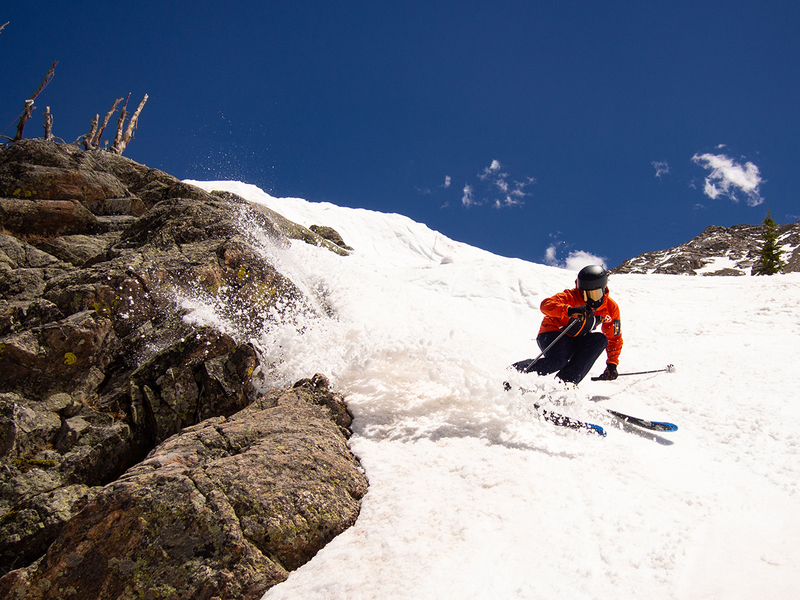 We were straight-up mobbing down A-Basin’s slushy, chunky summer groomers, and I was pretty blown away by how little feedback I was getting from the Alpinist. The Alpinist did feel harsher than an alpine binding (duh), but still, the Alpinist’s downhill performance was impressive. And as for Sam’s note about the energy he felt transferred by the bindings, I can’t say I noticed a big difference, and I’d personally take in a heartbeat the better damping of the Alpinist over the other, harsher bindings. The really important caveat here is that I spent most of my time on the Alpinist in fairly soft, to very slushy snow, so it wasn’t the harshest snow in the first place. But even in this soft snow, the Alpinist was notably smoother than all the other bindings in the test. I’m very curious to A/B the Alpinist against some burlier tech bindings like the Dynafit Rotation 10 and Fritschi Vipec Evo in order to see how much of a downhill-performance upgrade you get for a couple hundred grams more. But based on my time on the Alpinist, I’m inclined to think it’s not actually that much. We’ll see. Sam: The Alpinist is a U-spring binding with adjustable lateral release. U-spring bindings have been shown to prematurely wear out the pin inserts in touring boots and change the release characteristics over time (in some cases, release characteristics can change dramatically). This is in contrast to heavier tech bindings that have separate heel pins which move much more easily around the boot heel insert when stepping into the binding. Every time you step into a U-spring binding, the spring itself needs to bend outward to get around the boot heel insert, which is more abrasive than bindings with independent heel pins (e.g., Dynafit Rotation 10, G3 Ion, Fritschi Vipec Evo). U-spring bindings also have much less adjustability when it comes to vertical release, since you have to change the spring itself to change the release value. Though these points count against the Alpinist, the binding does have active length compensation which should increase consistency of release compared to the other bindings in this test that require a gap between the heel piece and boot to compensate for ski flex. If safety is your primary concern, I would recommend the ATK Raider 2.0 / Hagan Core binding. That binding is fully adjustable in both vertical and lateral release, and has rotating heel pins that won’t wear the heel inserts in your boot as fast as a U-spring design will. For U-spring bindings like the Alpinist, it becomes extra important to keep a close eye on the heel inserts of your boots to make sure there isn’t excessive wear developing, as it can affect the release properties of the binding. Though the play in the Alpinist heel tower is definitely a concern when it comes to long-term durability, we haven’t experienced any signs of abnormal wear on our pair of the Alpinist. Much of the binding is made from carbon-reinforced plastic, and it feels surprisingly solid considering the amount of plastic in the binding. We’ll be putting a lot more days on all the bindings in this test next season, and will be sure to keep this review updated if any noteworthy durability issues arise. The Alpinist will work best for those who strongly dislike the harsh feedback of most lightweight pin bindings, and will work even better for those who tour in places where you’re able to set more mellow skin tracks. The Marker Alpinist 12 is a feature-rich, lightweight touring binding that offers a surprisingly smooth and confidence-inspiring ride on the downhill, but that has a few quirks when it comes to transitions, stepping in, and walking uphill. If you’re looking for a lightweight touring binding for long days and high peaks — especially if you prioritize downhill performance over ease of use — the Alpinist 12 is definitely worth a look. Maybe the tilt mechanism of the heel piece explains the smoothness while skiing? Could also explain the loss of pop (it gets filtered out)? Hey Konsta, I think the play in the heel could act like a low pass filter and contribute to the smoothness. It’s hard to figure out exactly why certain products feel the way they do without being able to tinker around a bit with different versions. Thanks for the review. Looking forward to the other additions. Don’t ever lock out your toe, just asking for knee injuries in a fall. So what’s the word on the tilt? Narpy – You’ve never heard of a “no fall zone”, where losing a ski is basically a death sentence? Any updates on A/B-ing this against the Rotation 10, Vipec Evo, or other burlier options? I bought it. Stepping in is pretty okayish (with Dynafit vulcan), In difficult condition im “locking” one pin and then the rest.. Im 100kg 1.93m high and using Alpinist 9. No prereleases, skied inbound and outbound. The back of the ski falls okay in kick turns, even with my binding moved 1cm back from center. The brake looks like a joke, soft spring, small travel under the ski, locking is pretty hard and if there will be icing between tower amd the locking wire, you will spend some time clearing it. Any thoughts/insight as to how this binding stacks up to heavier/burlier bindings? Thinking Ion, Rotation, Radical, etc…? Hey Alex, the Alpinist is way more minimalistic than those bindings. It won’t be as durable or as feature rich as the heavier offerings.